My evolution as a cook and a baker has mirrored my life. At first (in my early twenties), much like a baby, I took small hesitant steps in the kitchen and I was amazed by just about everything I cooked (instant ramen noodles!). I soon grew more daring, and, like a hyperactive toddler, started to experiment wildly with my newfound hobby, most of the time falling flat on my face (undercooked chicken; burned veggies; I guess eggs will cook when you pour hot milk in them). A few years of cooking under my belt and I started to get serious. Just like a precocious teenager or a self-involved young adult, I developed strong opinions (I only use European style butter!) and became decidedly preoccupied with appearances. I wanted everything I cooked to look amazing. Flavor was important but presentation was king. I guess I’ve now reached the middle age stage of my life as a cook (conveniently at the same time as the middle age stage of my actual life). Much of the time my cooking is about simplicity, convenience, and strong flavor. I favor recipes that make intuitive sense and result in deeply satisfying food without too much fuss. This recipe fulfills those criteria perfectly. 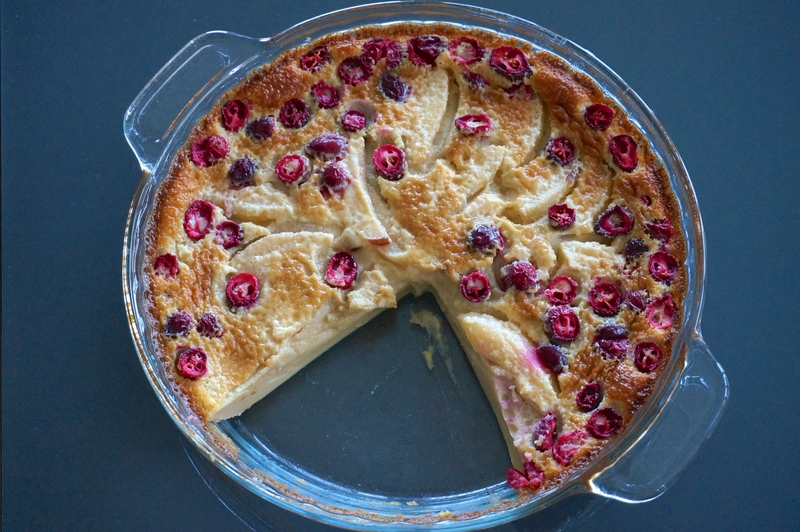 It’s a clafoutis, a classic French dessert, but not the fancy kind. It’s basically a baked custard, made in a blender and baked with fruit. 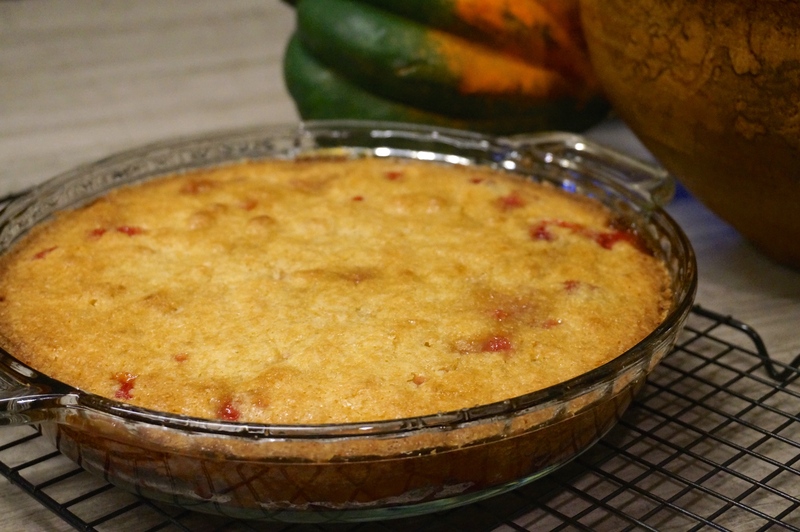 The original recipe appeared on Orangette, Molly Wizenberg’s extraordinary food blog. 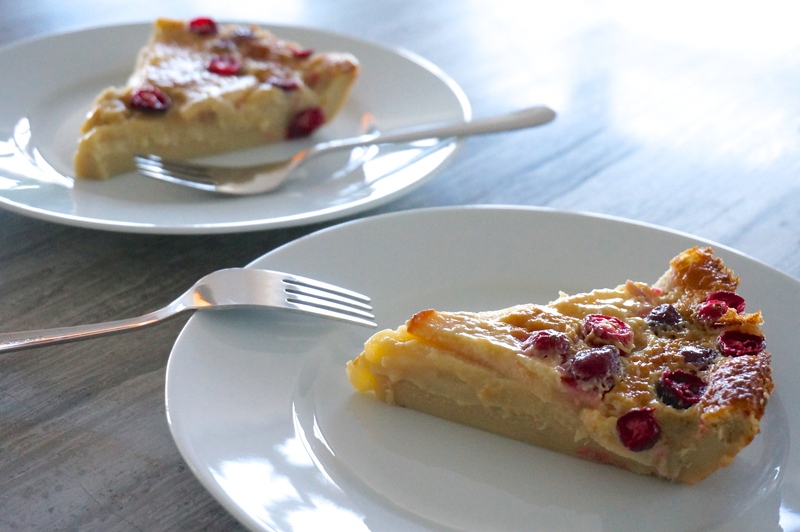 I adapted it slightly, to incorporate some left over cranberries and to add a hint of almond flavor. The result is a dessert that may lack in the looks department, but makes up for it in flavor and texture. And it comes together in minutes. You can eat it for dessert or you can do what we did and have it for breakfast. Because when you reach middle age, you can do whatever the hell you want. Preheat the oven to 375°F. Butter a 9 ½-inch pie plate and dust it lightly with 2 teaspoons of granulated sugar. Shake out any excess. Peel and core the pear, and slice it thinly in 14-16 slices. Arrange them on the bottom of the prepared pan. 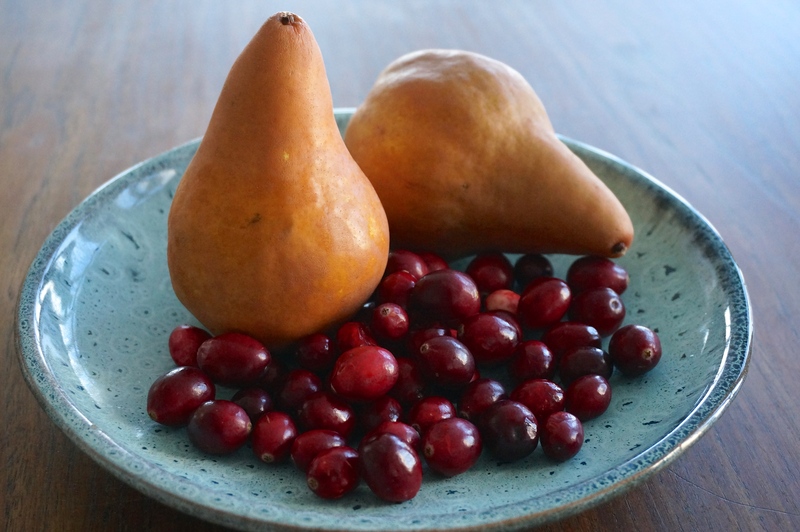 Sprinkle chopped cranberries over the pears and top with the remaining 2 teaspoons of sugar. 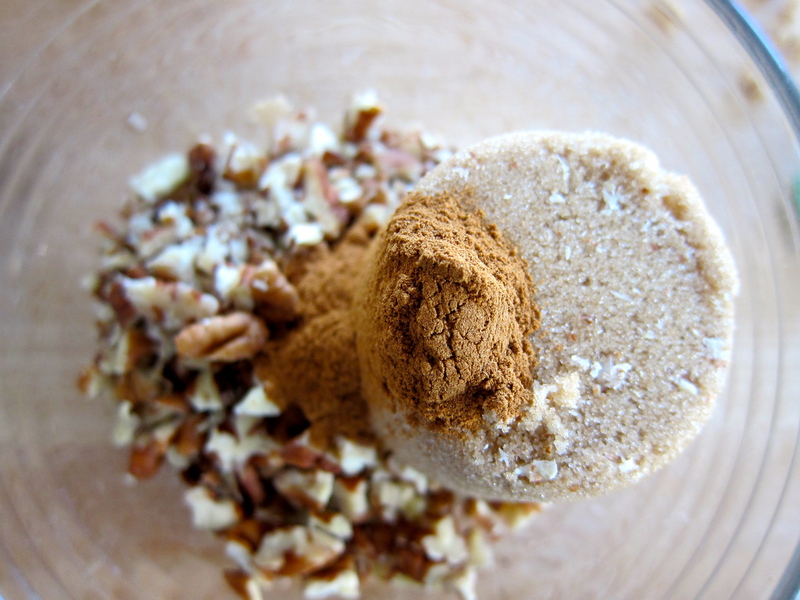 In the jar of a blender, combine the milk, brown sugar, eggs, extracts, salt, and flour. Blend on high speed for about 30 seconds. Pour the batter over the pears and cranberries. Bake until the custard is puffed and golden brown and the center is almost completely set, 30 to 35 minutes. Cool on a wire rack. We were in a taxi, on our way to see the open studios at the Gowanus canal last Sunday. The temperature had suddenly plunged, barely making it to the mid 50s. As the car zoomed along the elevated section of the BQE, I caught a glimpse of the tops of trees (ash trees?) swaying in the wind. Their leaves had already turned canary yellow and they seemed impossibly bright, against the brownstones and dark asphalt in the background. And I thought It’s ok. Fall is here and I’m ok with that. When I was little (kindergarten? first grade? ), I remember teachers having us color pre-drawn and mimeographed sheets with things that represented each season. The summer had the sun and stalks of wheat. The spring had flowers and swallows: we glued cotton balls to their bellies and filled the rest of their bodies with black crayons. The winter had snowmen and Christmas trees. But fall? I don’t remember what represented fall. Maybe yellow leaves, though it’s unlikely. There were few trees that turned colors the way they do in the Northeast U.S. It wasn’t cranberries or pecan pie or Thanksgiving turkey. I didn’t know about these things until I came to the U.S. later as an adult. It was probably rain. Grey clouds and children holding umbrellas, which we colored with as many colors as we could get our hands on. This recipe is pure fall. Cranberries and pecans are cooked together with a decent amount of sugar, turning sweet and tangy and crisp, underneath a topping that is rich but not overly so. The original recipe called for three quarters of a packet of butter. I replaced two thirds of that with refined coconut oil (the kind that has no coconut taste) and the result was perfect. It’s still not quite health food, but it’s a great way to ease into the season. Preheat the oven to 350°F. Lightly grease a 10″ pie plate or 9″ square cake pan. Melt 1 tablespoon butter, and drizzle it into the bottom of the pan. Spread the chopped cranberries and nuts in the bottom of the pan. Sprinkle with the 1/2 cup sugar. 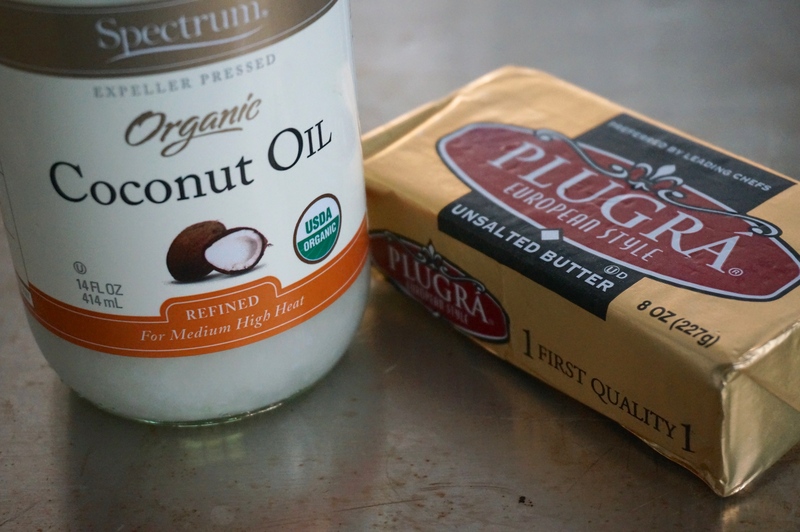 In a mixing bowl, beat together the eggs, melted coconut oil and butter, sugar, flour, salt, vanilla, and almond extract. Spread the batter over the cranberries and nuts in the pan, using a spatula to cover everything. Evenly sprinkle turbinado sugar over the batter. Bake the pie for 40 to 45 minutes, until a cake tester inserted into the center comes out clean. Remove the pie from the oven and let cool on wire rack. Serve warm, or at room temperature. I was reading Molly Wizenberg’s blog Orangette the other day. First, let me just tell you that Molly is one of the best food writers currently out there. Scratch that. She’s one of the best writers. Period. If you haven’t read her blog or her book , go read them now. I strive to emulate her knack for blending personal stories with spot-on, yet unorthodox, descriptions of food and cooking. For me, she is the heir to Ruth Reichl (not that Ruth has abdicated her throne yet). Anyway. Molly was writing about repetition in cooking. About how she tends to go back to the same recipes and make them over and over again. Don’t we all? There’s comfort and safety in familiar recipes. When you have one that works, that’s not to hard to make, that results in food that’s exciting or satisfying or impressive, why wouldn’t you go back to it repeatedly? In fact, a big reason why I started this blog was to share exactly those recipes that I find myself reaching for again and again. Nobody can deny the thrill of trying out a new recipe, one that caught your eye while reading Bon Appétit or your favorite food blog. But like any unexplored territory, an unfamiliar recipe can hide unseen dangers. Despite the assurances of the writer, your cake never rises beautifully like in the photograph, or your leg of lamb comes out tough, almost crunchy, like cartilage. Not that tried-and-true recipes don’t offer themselves to some adventure. 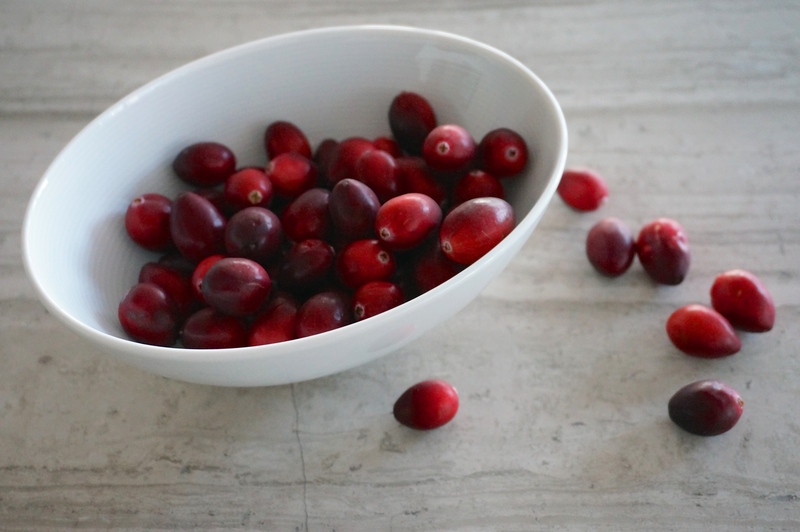 Over time you may start replacing ingredients (either on purpose or because you forgot to buy the cranberries). Or you may start adding things you suspect would improve it. But most of the time, you just stick to the plan, knowing that, like an old friend, they’ll never let you down. One of those recipes for me is the one I’m sharing with you today. 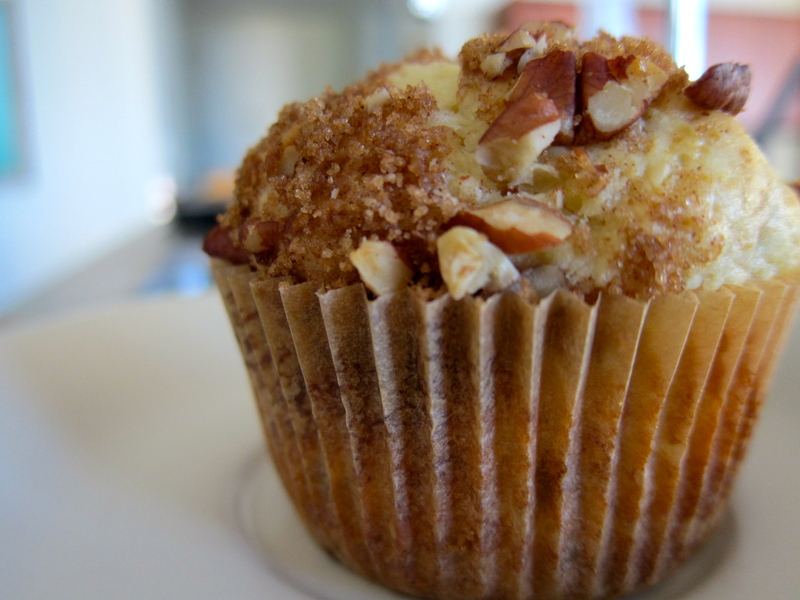 I make these cranberry orange crunch muffins year-round. They are the perfect muffin. Their slightly crisp exterior gives way to an incredibly light interior. They are almost spongy, though not unpleasantly so. 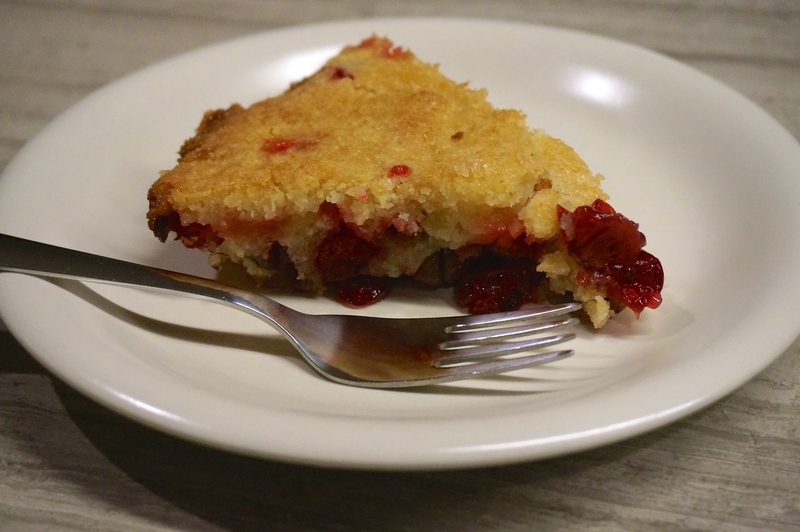 The mildly sweet crumb is bracketed by tart cranberries and the toasted sweetness of the pecan topping. Fresh cranberries will soon be everywhere. It’s one of the joys of fall (along with butternut and acorn squashes and apples). But you can easily use frozen cranberries to make these. No need to thaw them. 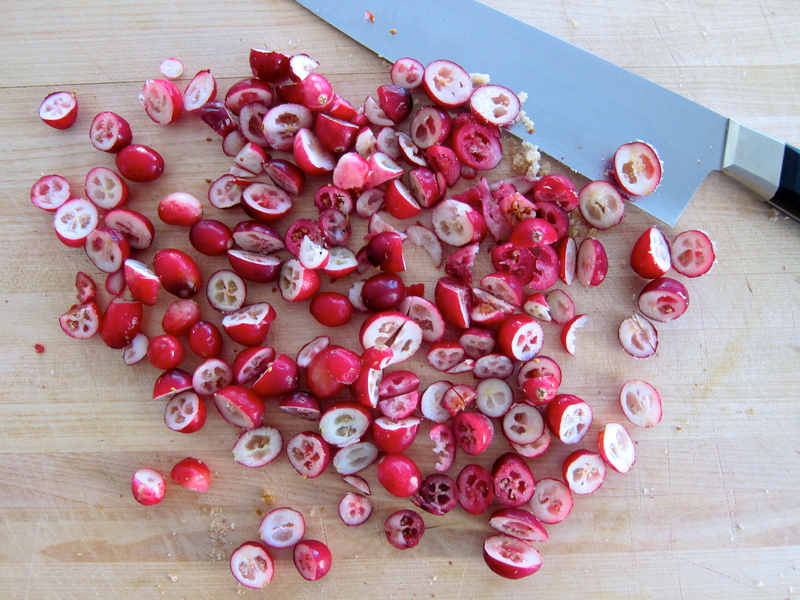 Just chop them and use them as you would with fresh cranberries. I bet that once you’ve made them once, you’ll make them again. And again. And again. Preheat oven to 400°F. Lightly grease 12 muffin cups or line them with muffin paper cups. Batter: In a medium-sized mixing bowl, whisk together the flour, sugar, baking powder and salt, then toss the cranberries in the mix and stir to coat. Using a muffin or cookie scoop, or a 1/4-cup measure, pour the batter into 12 lightly greased muffin cups, filling them about 3/4 full. Topping: Combine all of the topping ingredients. 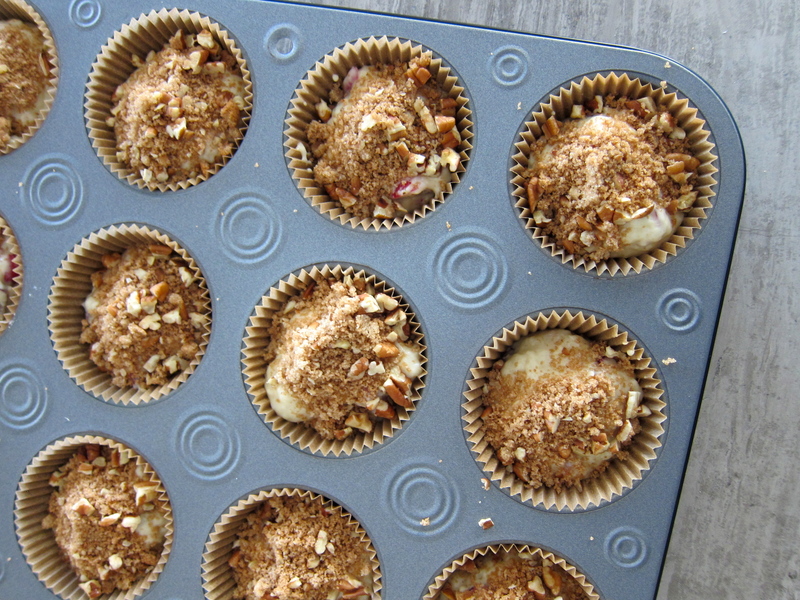 Sprinkle about 1 tablespoon of topping over the batter in each muffin cup. Baking: Bake the muffins for 20 minutes, or until they’re nicely domed and a cake tester inserted into the center of one comes out clean. Remove the muffins from the oven, and run a knife around the edge of each one to separate it from the pan. 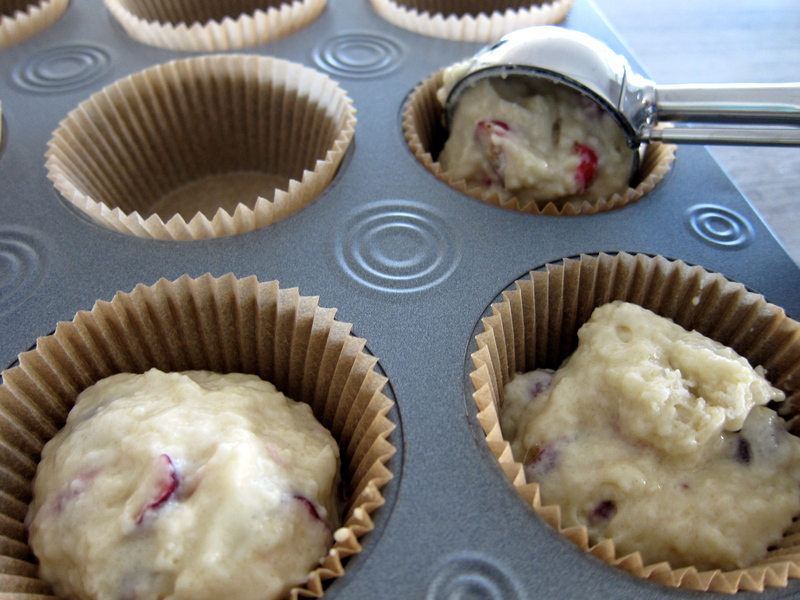 Carefully tilt each muffin in its cup so steam doesn’t collect underneath as they cool. After about 5 minutes, transfer them to a rack to cool completely.